Jan 25 Three generations. Three Curries. Three Continents. A rendition of this curry has been made by three generations of her family, in three countries, on three continents. “We’re...nomads,” exclaims Gillian’s son Ilan, who shared his version of the curry, made with chicken and thickened with coconut milk, with us. 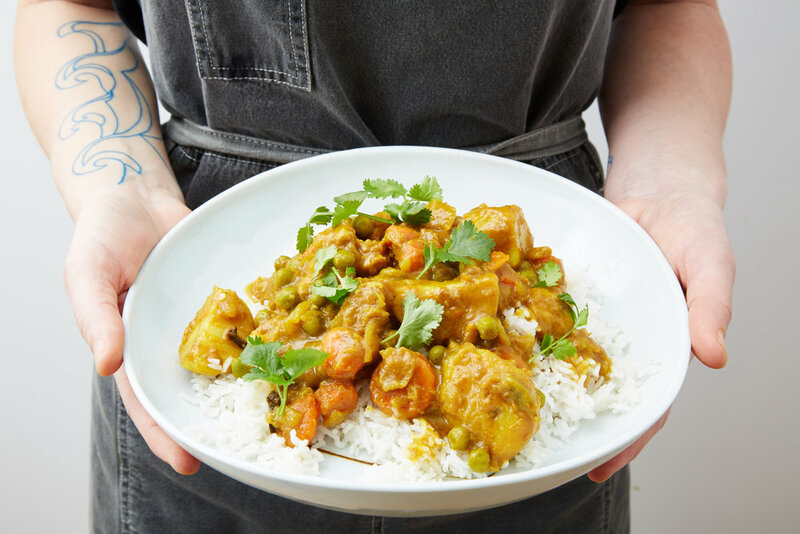 The curry tradition originated in the family with Gillian’s grandmother Cilla who moved to South Africa in the late 1800s as part of a wave of Lithuanian Jewish emigration. “She was a great cook of very Lithuanian style foods,” explains Gillian. Cilla’s holiday table was laid with gefilte fish made from scratch, chopped liver, herring, and tzimmes or sweet cooked carrots. But, as Cilla settled into her new home country, her culinary repertoire expanded. Borrowing a tradition from a local Indian community, she started to make curry, tinged with sweetness. “She was very proud of herself that she stepped out of the box,” Gillian adds. It was a staple dish when Gillian would visit, but she never made it with her grandmother. Growing up in the era of Apartheid, “South African girls didn’t go into the kitchen,” she explains. “We were very spoiled. It was a despicable way of life.” She only entered the kitchen around the time of her immigration to Israel in 1971. In her new adopted home, she set out to recreate Cilla’s curry recipe. No longer able to find the same boxed curry blend, she purchased a different one and combined it with what she knew from her grandmother. She also tweaked it to her taste, making it spicier. The curry became a staple of Gillian’s cooking and a regular part of the dinner cycle when Ilan was growing up in the 1980s. Gillian Benatar as a young girl. When he moved to a moshav (an organized community) outside of Jerusalem in his 20s, he found himself in a similar position to his mom at his age. “Suddenly, I had to cook for myself,” he says. When he started to date his now-wife Naama Shefi, the founder of the Jewish Food Society, he returned to the curry, calling his mother for the recipe. Thinking back, Ilan laughs at the idea of trying to woo with curry. “I tried to impress her with it, which is kind of weird, it’s not a very romantic dish,” he says. Perhaps not, but it was beloved by Naama and it migrated with him when he moved to the U.S. to be with her. “That’s where it really made the jump from my mother’s recipe [to mine],” Ilan says. He adjusted the spicing, adding cloves and cardamom, thickened the sauce with coconut milk, and replaced the beef for chicken. Over the years, Naama added her touch, with a splash of yogurt and fresh cilantro, bringing the recipe to its current iteration. While the dish has become a regular staple of their shared home, it continues to register as a special occasion dish, reminiscent of the early days of their relationship. Gillian hasn’t tried Ilan’s rendition, but she isn’t bothered by the changes. With each generation, this curry moves and morphs to the cook’s palate. 1. Place the potatoes and carrots in a medium saucepan and cover with water. Bring the water to a gentle boil and cook until softened, about 5-7 minutes. Reserve 1-2 cups of the cooking liquid, then drain the potatoes and carrots and set aside. 2. Meanwhile, in a large stock pot, heat the oil over medium-high heat. Add the onions and sauté until translucent, about 10 minutes. Add the garlic and ginger and sauté until fragrant, about 1 minute. Add the curry powder, turmeric, cumin, and salt and stir until combined. Add the tomato paste and stir to incorporate until the paste darkens, 1-2 minutes. Add ⅓ cup of the reserved cooking water and mix to combine. Add the cardamom pods, cloves, apricot jam, Indian chili pepper (if using), and additional cooking water as needed, to form a thick paste similar to that of a pea soup. 3. Lower the heat to medium-low and cook for 15-20 minutes. Meanwhile, bring 3-4 cups of water to a boil in an electric kettle or on the stove. 4. Add the potatoes and carrots and to the pot. Gradually, while stirring, add 1 cup of the boiling water. Stir to combine, then gradually add additional boiling water as needed to just cover the ingredients in the pot. Increase the heat to medium and simmer for 15 minutes, stirring occasionally. 5. While the curry simmers, heat 2 tablespoons of oil in a medium saucepan over medium-high heat. Add the chicken cubes and lightly sear until the color changes to all white, about 5 minutes. 6. Add the chicken to the pot and reduce the heat to medium-low cooking for 2-3 minutes. Add the peas and additional water if needed. The ingredients should just be covered and the consistency should be similar to a thick pea soup. Simmer over low heat for 30 minutes, stirring frequently. 7. Add the coconut milk, stirring to incorporate well. Remove from the heat and let rest for a few minutes before serving. 8. Serve over basmati rice with yogurt and cilantro on top.